It would be awesome if the email parser went a little deeper. Sometimes a client emails us directly and we forward that email to Pulseway to open a ticket. The problem with this is that it opens the ticket using our company as the client. It would be great if we could get the parser to look in the email headers to find the address that the email originated from and use THAT to assign and client and user to the ticket. There are other ticket systems that do this. Alternatively (though not as elegant), It would also work to put a flag in the subject line like "@CLIENTNAME" to get the email assigned to the client. Is there a way to do this with workflows? 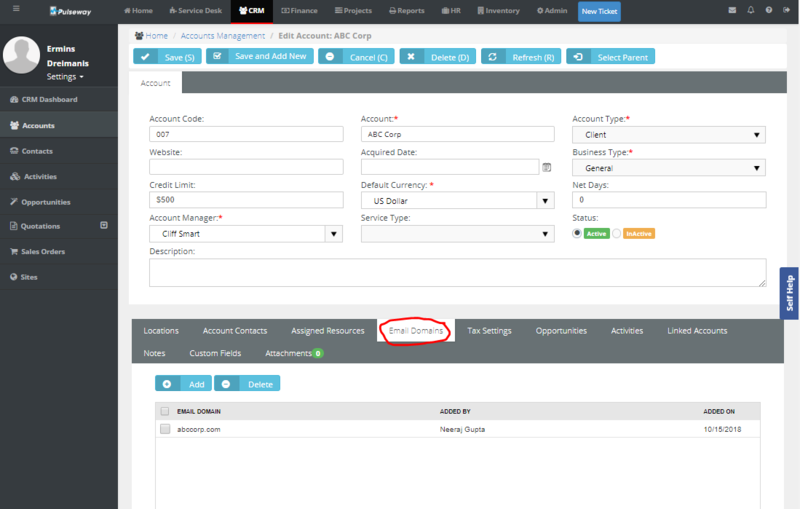 This functionality is already available for you, have you tried to configure the email domains for your customers? For more details about this please check out the following article. I have, but this doesnt work if they send ME an email and I forward it to PulseWay. THOSE emails end up being listed under our company, not theirs. Please try to explain to me why would you forward the emails from Pulseway to the Pulseway PSA? 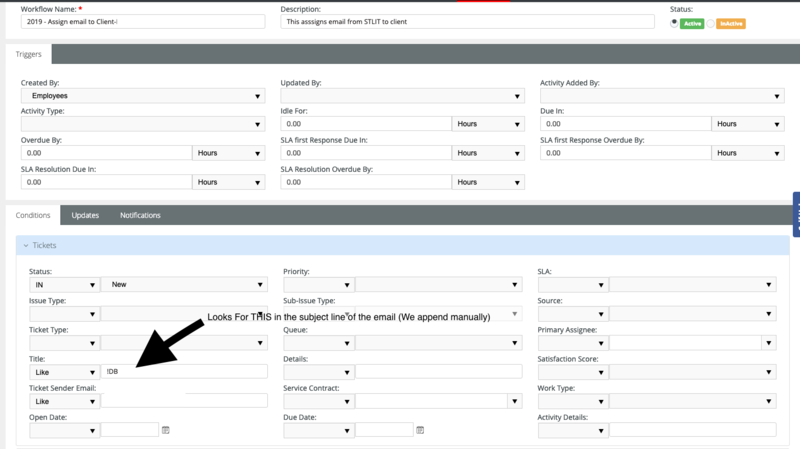 Pulseway PSA and RMM are integrated, therefore there is no need to forward emails to PSA. I think you are misunderstanding the issue. example Customer sends an email to my work email (not support@ account, an account that doesn't go through Pulseway email parser) saying they have an issue. I then forward the email to my support@ account which goes through the Pulseway email parser. Now the ticket says it came from my company. This issue is common for us also. Mainly when we are out in the field and we forward the email to create a ticket so another available tech can work it. I'm not sure if it is a good idea to search for the email address from which this email was originated in to the email. It is match simpler to ask your customers to send emails to the help-desk in a first place and then manage them from there, because that is the whole purpose for this application. And then into the Pulseway PSA you have the option to create workflows which will assign tickets to correct queues and notify the technicians that the new ticket was created. Also, multiple technicians can work on the same queue and once they start to work on the ticket, then technician can assign that ticket to him. Chris, that would be nice if customers only sent to support@ for example but most of us know that in reality customers send to our own personal email addresses. My current ticketing system allows me to send the original email, using Forward as an attachment, and the ticket is allocated correctly. Some ticketing systems will check the original emails even if forwarded and allocate to the correct customer. Pulseway PSA needs to address this in one form or another. Have you tried to add multiple email parsers to your PSA instance (add your personnel email address so email parser can Pars emails from it)? You may try to create the separate folder in your inbox for these support request emails and then once you place an unread email in this folder, then IMAP will read this email and create a ticket from it. I have resolved this is kind of a kludgy way...I have created an email rule that look for a particular code in the subject line of the email so if I put !CLIENT it will assign that ticket to a particular client. it will not assign it to a particular user, but this is better than nothing. Can you share how you set up this rule? I'm sure it will help a lot of people like us facing the same issue. From the responses above I really think Pulseway simply does not understand the issue and how common it is. I would love to see a rule added to the patching policy where you could filter patches by date. For example, only install patches that were released before a certain date. This would allow you pick a date that you were going to role out to your different environments and make sure you were installing the same patches on all systems (Dev, Test, Prod, etc) even if patches were released during the time you were moving from dev to prod for example. It would be great id we would select multiple tickets in order to change their status. This would be particularly helpful with tickets that are generated automatically by the RMM based on an alert that's initial status has cleared.